Here at LaurenConrad.com, we know the importance of a practical (yet pretty!) workspace. When you spend a majority of your week in an office like we do, it’s important to create a space that enhances inspiration and productivity. Having a clean desk is useless if an untidy office constantly distracts you. Since every workspace is unique, we’ve written down our tried and true tips to both organize and beautify the space that you already have, no matter the size. Today we’re sharing helpful tricks to declutter, reorganize, and create an office that’s both lovely and constructive to your workflow. Plus, we’re throwing in a $1,000 giveaway to Lulu & Georgia to help you style your dream space! When creating the perfect workspace, functionality should come first. While brainstorming ideas for our Team LC headquarters, we knew that we were going to have to accommodate a tight office space. Going the ergonomically friendly route meant finding pieces that would allow us to move around the office while still being comfortable. Since our space is limited, sharing a square table made sense for our office. A typical workday requires a lot of sitting so the next step required finding office chairs that were comfortable to sit and work in all day long. These Waller Woven Office Chairs from Lulu & Georgia have us sitting pretty! We even added a couple of Kenza Moroccan Poufs for putting our feet up while we work. Staring at computer screens and paperwork is hard on your eyes already. If your office doesn’t have windows or a natural light source, we recommend finding adequate lighting to brighten up your space. 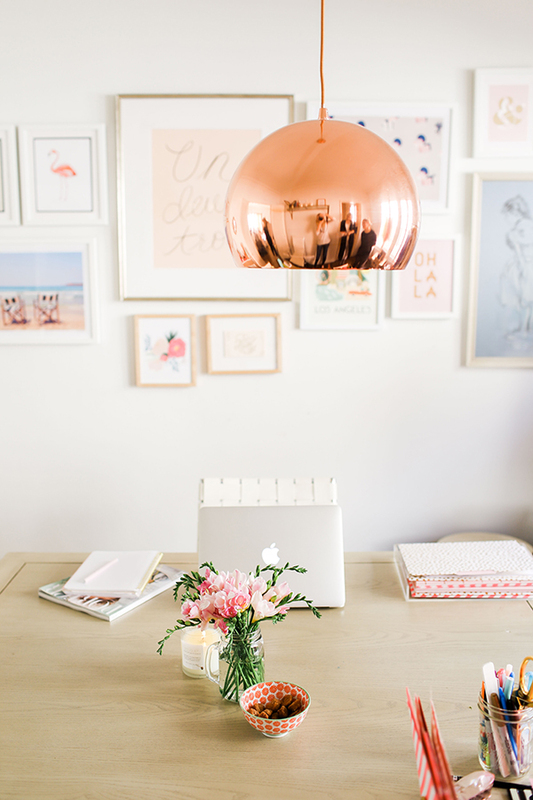 Fluorescent lights can make an office seem drab, so we chose this copper Zaza Glam Pendant from Lulu & Georgia. It’s aesthetically pleasing and provides the perfect amount of light for when we’re working late at the office. The best part about reorganizing and redecorating your office? Letting your personality and interests shine! Here at Team LC we are all about bright, colorful, and feminine details. So before we started collecting pieces for our office, we created a Pinterest board with tons of office décor inspiration. It was a breeze when it came to purchasing items because we narrowed down all of our favorites! When designing our office, we all agreed that a gallery wall needed to be the center of attention (create your own following this helpful tutorial!). Collecting fun prints allowed us to incorporate our personalities seamlessly into the office décor. The pink in some of our gallery wall prints ended up pairing perfectly with our Lulu & Georgia Pari Rug! We love how everything tied together. Nothing adds to a stressful workday like a cluttered office. Keeping your space organized can have a serious impact on your productivity and save you some major headaches down the road. Digging through drawers and unsorted paperwork is the last thing you want to do! Instead of purchasing a cold, metal filing cabinet, we encourage you to get creative and find alternative storage solutions. Our office is a little unconventional when it comes to storage needs. 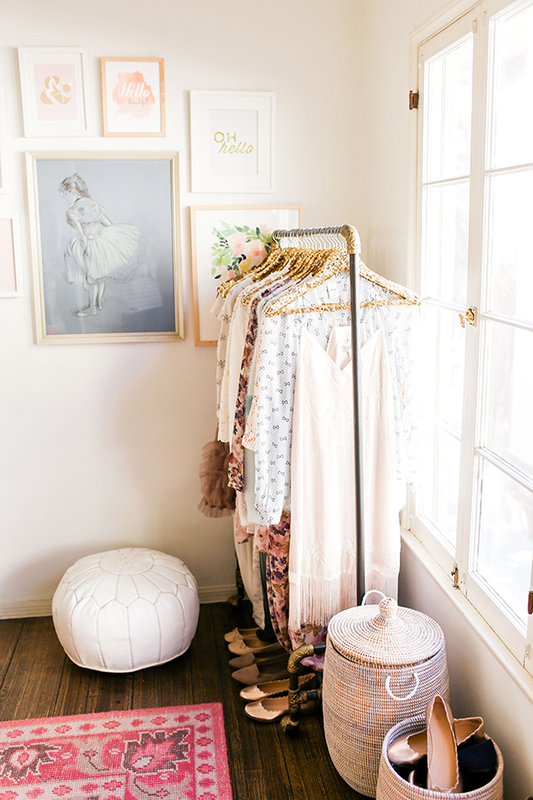 For example: we needed to store LC Lauren Conrad clothing and shoes in a chic and space-savvy way. So we put our Whimsical Hamper from The Little Market to good use as well as a wardrobe rack to display current LC Lauren Conrad collections. When it comes to organizing our desk and filing away papers, we shop all of Ban.do’s fun office supplies. Pens, file folders, and agendas, you name the supply, Ban.do has the cutest version of it! Browse. You’ll want to head over to Lulu & Georgia’s website and take a peek at their beautiful selection of office furniture and décor! Comment. Leave a comment below letting us know how you’re planning on creating your own chic and functional office. Enter. Enter the giveaway by entering your email in the form below. Wait. We will announce the winner on Wednesday, February 3rd. Do you have any helpful organization tips?